Always More to Hear: Happy 332nd Birthday Antonio Vivaldi!! I'm so glad I did not live in this century...just look at that outfit! Antonio Vivaldi has somehow become my favorite classical music composer. I'm sure it started with his Concerto Grosso in G minor (listen below) being on my music history final in college. The "Allegro," the second movement is so ridiculously awesome. I always equated this music to being the heavy metal of its time with the virtuosity it requires. I remember walking to the lecture hall with this on my earphones feeling totally empowered. "I'm going to ROCK this exam!" 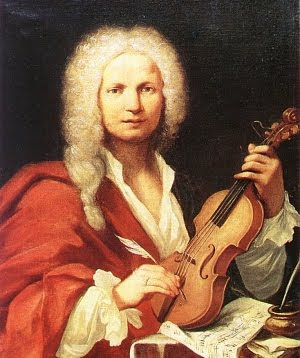 Over the years I've accumulated a few different Vivaldi CDs and compilations and he has become my "brain" music. When I need to concentrate, I put on some Vivaldi. Others choose Mozart for making them smart, I use good old Antonio. There is something so regal about his music. To me it is soothing. So, happy birthday old man! And to you readers, enjoy a couple of my favorite string concertos: one in G minor and one in D minor. I love Vivaldi. Haha and just saw that the previous commenter said the same thing. He's my boyfriend. Thanks for posting! I like it when you guys comment!